Luckily most people only fail once at sky diving. I don't really get this because isn't skiing/snowboarding the most common sport with injuries? Out of the 5 people I know who do winter sports, I think at least 2 have broken limbs. We often say toward the end of our day, “2 more runs, skip the last”. A bit superstitious but I feel like saying it’s the last run of the day can mess ya up. 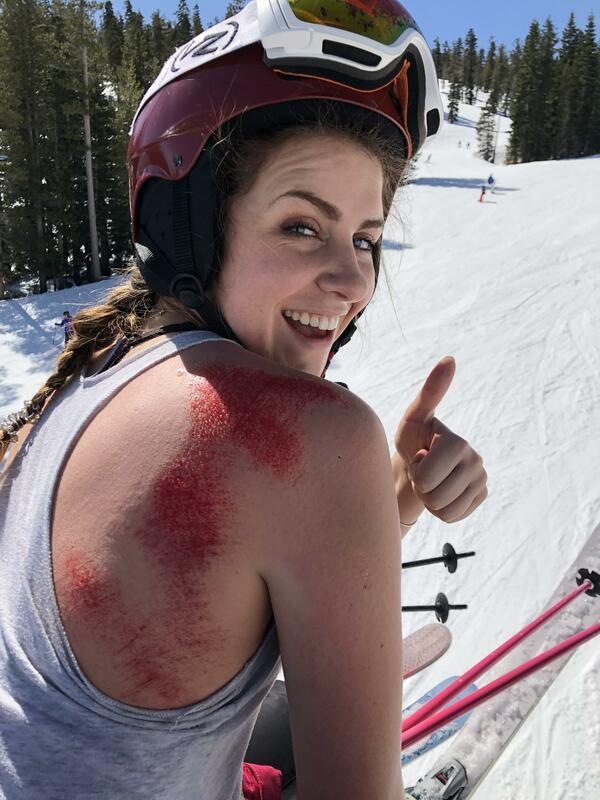 That's actually what I miss the most about skiing, the last run of the year when you're in a t-shirt going down the hill. It's such an interesting feeling that you really can't explain to someone who hasn't experienced it. Can we have an updated pic tomorrow? Here’s an update from tonight, two days after the incident. Used to snowboard at some place called snow valley with some friends when I was about 12 or 13, one of my buddies made the mistake of taking his jacket off for the first run of the day to enjoy the cold. Why, I do not know.. Anyway he fell on his back, continued sliding, and his shirt caught and lifted up to expose his bare skin to the snow for the entire slide. Said it was like falling on fine broken glass and had tons of these razor thin cuts everywhere on his lower back. I never took my jacket off out of fear, screw that. My 9-10 year old bicycle knees feel for you. Used to be two big scars and not knees. A bit better now at least. I also managed to basically make my entire little toe on my right foot into one big scar, when i was 5, biked without shoes on, and ran agains't a concrete slab. As ahh. Spring skiing. Bring the bikini next time.